According to the WHO, nearly 1.7 billion cases of diarrhoeal disease occur worldwide every year, illnesses that kill about 760,000 children under five years old. Other profound health consequences for children include physical and cognitive stunting, and severe malnutrition. Diagnostic tests are essential, but useless without properly collected specimens. The objective of this Botswana-based collaboration led by Dr. David Goldfarb was to design and evaluate a user-friendly flocked swab specimen collection system for the identification of enteric infections. This would have immediate impact in much of the world were diarrheal disease remains deadly and for the large part undiagnosed. Using an inexpensive innovation in specimen collection, the Canadian-led team diagnosed previously unrecognized pathogens that had caused the severe diarrhoea of over one-third of children in a group of southern African hospitals. McMaster University researchers designed and tested in Botswana a specially-designed “flocked swab” for collecting samples from children admitted to hospitals with severe diarrhoeal disease. The flocked rectal swab eliminates the wait and biohazard involved in obtaining and transporting a bulk stool (feces) sample from an infant or child. This efficiency enabled implementation of a randomized clinical trial evaluating same-day diagnosis and treatment for a broad number of pathogens – the first study of its kind anywhere. Published May 16, 2015, by the Journal of the Pediatric Infectious Disease Society, the study documented that over one-third of 671 babies hospitalized with severe diarrhea – including 17 of 26 (65%) who ultimately died – were infected with a treatable pathogen, infections that had gone unrecognized at the hospital and therefore generally went untreated. Because so many of these severely ill children had treatable conditions, the researchers subsequently clinically tested whether same-day rapid diagnosis, followed by timely, appropriate therapy, would lead to improved outcomes. Children randomly chosen for rapid testing using the flocked swab and appropriate treatment were 55% less likely to have diarrhoea recur, compared with children not chosen, and they had a clinically significant height gain after 60 days. This measure of growth is an important indicator of children’s ability to reach their full developmental potential. 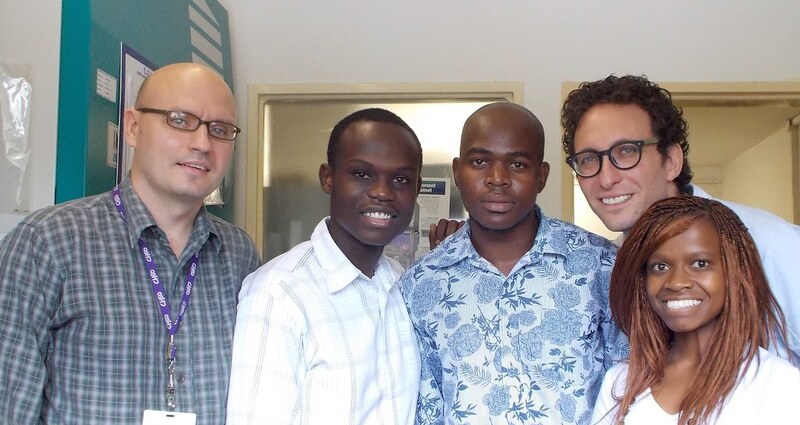 Led by David Goldfarb, MD (formerly of McMaster University, now at the University of British Columbia), along with Jeff Pernica, MD (McMaster) and collaborators Isaac Quaye, PhD (University of Namibia) and Margaret Mokomane (University of Botswana), the researchers witnessed dramatic health changes as a result of the rapid test-and-treat strategy. And the ‘treatment gap’ revealed in their Botswana research uncovers a major opportunity to make a significant, long-term impact in child health worldwide, they say. Thanks to the group’s research, valuable information acquired at a national level about the specific germs causing child diarrhoeal disease facilitated Botswana’s fast-tracking of an immunization program and the development of rapid antibiotic treatment protocols. Botswana’s anti-Rotavirus program, addressing the leading cause of severe diarrhoea among infants and young children, has vaccinated over 100,000 children and is credited with an overall 55% decrease in the mortality rate among infants at four hospitals during the first Rotavirus season after the vaccine roll-out. Further analysis two years after the vaccine introduction shows a 32% decrease in all-cause infant diarrhoea mortality, and a 26% decrease in all-cause infant diarrhoea hospitalizations. Resembling an oversized Q-tip® but with a furry 3.2-cm (1.25-inch) tip of nylon fibers attached perpendicularly to the end of a plastic stem, the flocked swab designed in Canada for this new diagnostic purpose, and manufactured by Copan Italia, began with a proof-of-concept grant in 2011 from Grand Challenges Canada. Unlike cotton swabs common in many homes, the flocked swab is like a soft brush with no absorbent core so the entire biological sample stays close to the surface, facilitating diagnostic tests. Produced at scale, a swab costs as little as 25 cents. In a study, published in November in the Journal of Clinical Microbiology, the innovators showed that a specimen obtained using the specially-designed flocked swab was 16% more likely than matched stool samples to reveal two leading, treatable bacterial pathogens causing diarrhea: shigella and campylobacter. The flocked swab, the researchers add, will benefit healthcare systems worldwide but especially in low-resource settings where incorrectly and ineffectively treated diarrhoeal disease wastes precious medical resources. The device will be used in Canada for the first time in the Gastroenteritis Surveillance Project in Nunavut, where acute gastrointestinal infections are at least two to four times higher than in other Canadian regions.